If you have older dogs with arthritis or dogs with other health problems and need to build a dog ramp, don't worry. Although you may not be Bob Vila, with good measurements and a bit of help, you can put a ramp together in no time. 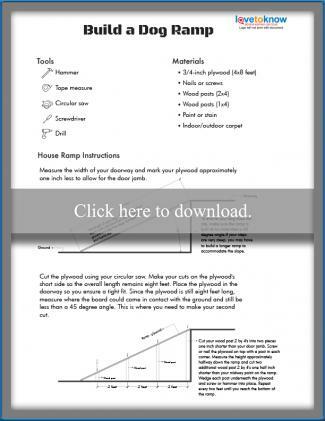 The plans provided as a PDF download detail all the required supplies and materials that you will need to build a ramp for your dog as well as step-by-step instructions. You will need Adobe Acrobat Reader to view the printable instructions. If you need assistance, there are some helpful guidelines on how to download and use a PDF document. Ramps are relatively easy to build, and blueprints are not required to build a simple ramp. If you prefer to have blueprints, there are a couple of online retailers who sell or provide dog ramps plans. Sometimes your older dog is fine in the house but has trouble dealing with outside steps, which can be larger and harder to maneuver for small dogs in particular. This set of plans involves plywood, some 6-inch boards, and basic woodworking tools to create a basic deck ramp for your dog. A clever addition to this set of plans for a ramp for a bed including a storage area. Ramps can take up a bit of room in your home so making use of the space for a dual purpose makes it extra handy. This simple set of plans to build a ramp over stairs uses scrap wood and doesn't require you to be a woodworking expert either! You can expect to spend about $40 total on supplies. If you want to build a ramp over stairs that have a steep angle, you'll have to make sure that you build in "assists" for the dog. This can be cleats every 6 to 12" depending on your dog's size, as well as adding in slip-resistant material such as carpeting, stair traction tape or rubber matting. 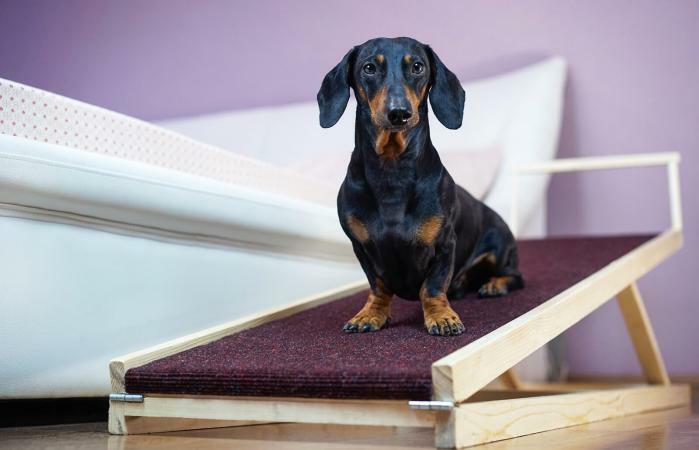 If you're not sure if the angle is too steep, some general guidelines for a dog ramp incline is a rise of 18 to 20 degrees for small dogs and 22 to 25 degrees for medium size dogs. Including guardrails along the side can also be a good safety precaution in case the dog slips off the side. Once you learn how to build a dog ramp, you may also want to tackle dog steps. The ramp can help your pet in and out of the house and car but steps may work better inside your home. Steps to reach the bed, sofa or certain areas in your home make it easier for your dog to move around while being more compact than a ramp. It's natural for older dogs to have trouble getting up and down steps and in and out of bed. A dog ramp can be a wonderful assist for a senior dog and benefit you as well by protecting your back from lifting your dog up constantly. If you have some basic DIY skills, you can put together a ramp in an afternoon that your dog will definitely be thankful for!